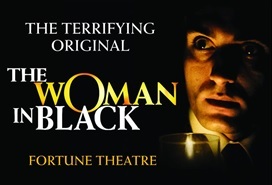 Back in December two of our Key Stage 4 students were taken down to London by Gilly (teacher) and Rosemary (Teaching Assistant) as part of their Drama qualification to see ‘The Women in Black’, at the Fortune Theatre in Covent Garden. 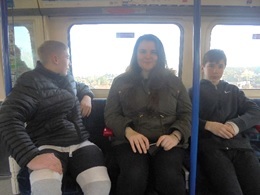 As part of their coursework James and George were asked to write a review about the play. Both gave the play 5 stars! 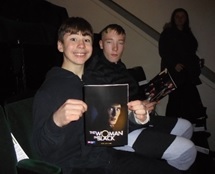 One cold Tuesday in December, we went to Covent Garden, London to go to a theatre to see the play, ‘The Woman in Black’. The play was about a man that got haunted by the woman in black. It was a thriller. The best feature of the play was the second part because it was scarier. In particular, the moment when the door slammed open made the audience scream. I really liked the use of the anti-naturalism technique because it was good how they used a basket as a horse and carriage. They made it believable by bouncing up and down on the basket they also used the basket as a bed. I think the play would be even better if less talking in the beginning because it was too slow. I would recommend this play to everyone above the age of 12 because it was an excellent play, but I think it would be too scary for under 12s. 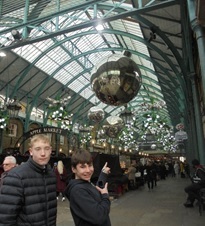 One cold Tuesday in December, we went to Covent Garden to watch a play called The Woman in Black, it was scary. The theatre was small and cramped, and we sat in the upper circle. The play was about a scary man that was haunted by a woman in a black hooded cloak. The best feature of the play was the costumes and the sound effects, such as ear bleeding screaming because it was like a jump scare and created an atmosphere that made the audience anticipate what may happen. I really liked the use of lighting because it hid the woman very well in dark scenes and she appeared and disappeared from backstage into the performance area. I think the play would be even better if they cut the start down and made it less wordy. If they got into the main story quicker, then the start would have been better. I would also have like to of seen the woman more. I would recommend this play to children 12 and over because it scared the soul out of me and I have I kept my guard up ever since.